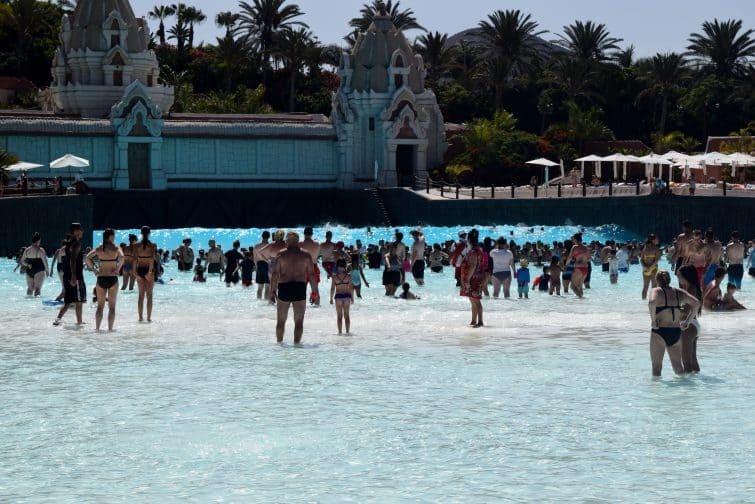 Siam Park, Tenerife is widely regarded as one of the best water parks in Europe if not the world – they have in fact just been named the world’s best water park by TripAdvisor for the 5th year in a row. 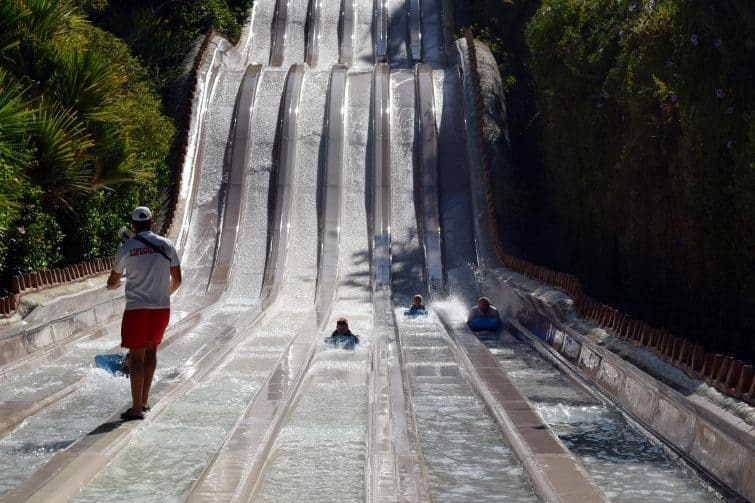 Dave visited Siam Park last year on a stag do and came back absolutely raving about it – full of tales of exhilarating water slides and showing Ben videos on youtube. 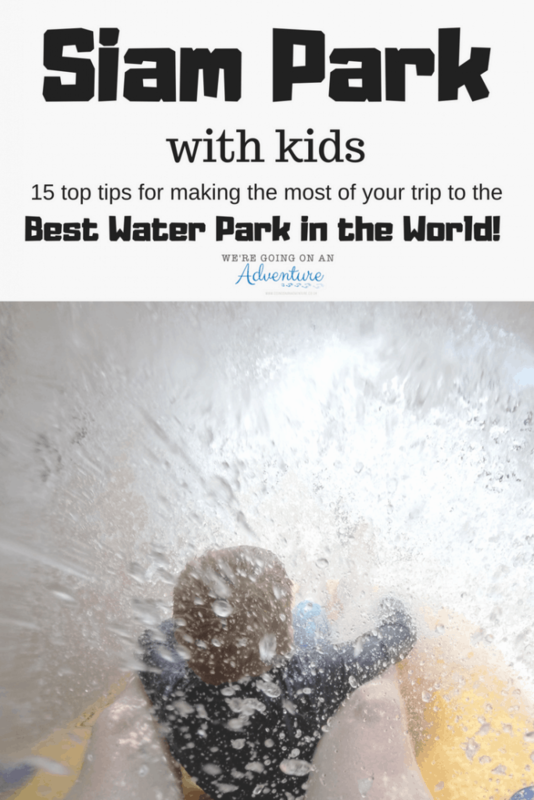 Of course visiting with the kids was a whole different ball game and we wanted to share our top tips with you for making the most of your day at Siam Park – some of these will apply to anyone, others are more focused on visiting with little ones but either way, you should find them useful in planning your trip! 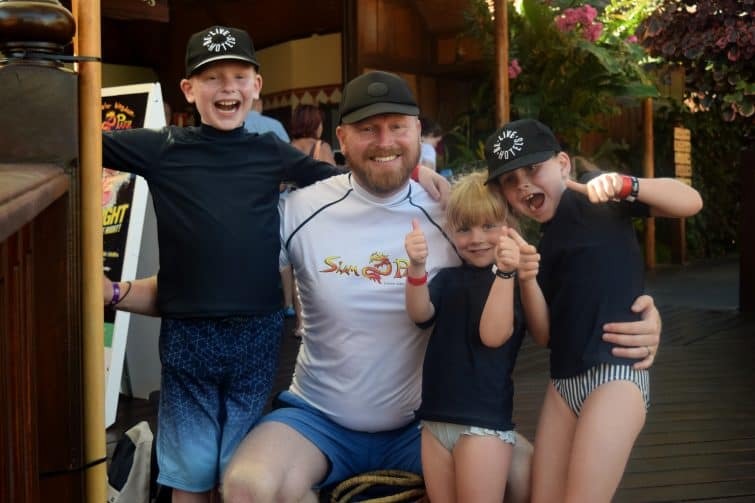 When Dave had visited Siam Park with the lads, they spent the day barefoot however I wasn’t comfortable with this for the children and thanks to the advice of another visitor in the changing rooms who told us the floor would be really hot, we decided to keep our flip flops on all day. This meant that we had to leave them at the bottom of various slides and queue barefoot. With hindsight, I wish we had bought proper swim shoes which could have been left on all day. These are available to buy at the water park but obviously they will be cheaper if you are prepared and buy ahead! I can’t tell you how many girls I saw walking around the park in teeny tiny bikinis. If you wear a bikini at Siam, I guarantee you’re basically going to spend all day checking nothing has fallen out when you get to the bottom of a ride! Treat your day at Siam Park as extreme sports and dress accordingly – this is a day for your one piece. 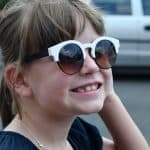 Whilst we’re on the subject of suitable clothing, it’s also worth considering wearing a rash vest for SPF protection if you’re visiting in the summer – our kids wore them fairly regularly on holiday anyway but we bought one at the park for Dave and it was without doubt the best thing we could have done. Although you will spend some time queuing in the shade, the majority of the day is going to be spent in the open – and wet. Your waterproof sun cream will only see you so far on this one. Again, you can buy rash vests in a range of sizes and colours at Siam Park but planning ahead won’t do you any harm. Life jackets are available for younger children to use free of charge however we took our own for Amy and she just kept it on all day for our own peace of mind. 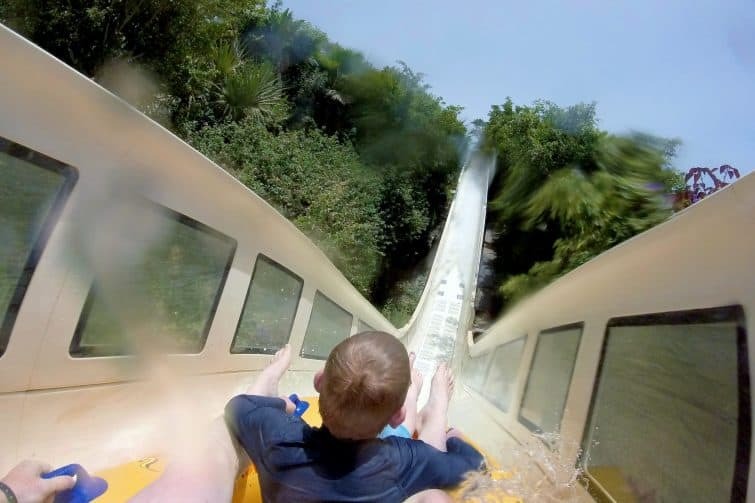 You really don’t want to be carrying your stuff around with you all day – you’d only have to leave it lying around at the bottom of slides risking it getting taken or just soaking wet. There are lockers situated around the park – 5 euro deposit and then a large locker costs 5 euros for a day’s hire, or a small one for 3 euros. We chose to offload our stuff fairly near the entrance but this does mean your things aren’t particularly accessible. We only returned to our locker once at lunch time to get some money for food and top up our sun cream. You don’t need to dry off between rides so don’t worry about dragging your towel around with you – just leave it in the locker with your change of clothes. You can hire towels from Siam Park for €3 + €5 deposit – we didn’t bother with this and just took our own. It seemed an unnecessary expense for five of us but it’s nice to know the option is there! I’ve already mentioned that you should make use of the lockers – I’m basically going to reiterate that here. Unless you’ve got someone with you who isn’t going to go on the rides (this would totally be my Mum’s job if she was with us!) then you’d have to leave your stuff on the floor at the bottom of a ride. This isn’t secure and it isn’t dry. Life will be much easier if you just leave your things in a locker. What this does mean is that you can’t have your phone, money, sun cream etc to hand so you need to think about planning in opportunities to pop back to your locker during the day. I wasted several hours at the start of the day carrying around my DSLR and vlogging camera in the hope of getting awesome shots of people whizzing down slides and generally having fun. Realistically what happened was that I couldn’t go on any slides as I was carrying my cameras, I kept missing the shot anyway as you can’t see much of the slide itself and everything happens too quickly, and I spent the rest of the time worrying about getting my equipment wet. It wasn’t even worth it as practically all the video footage was ruined when my vlogging camera got condensation in the lens. (Thankfully, this seems to have been a temporary issue and I don’t think I’ve caused any lasting damage but you can imagine how stressed out I was!) With hindsight I should have just focused on using the GoPro! 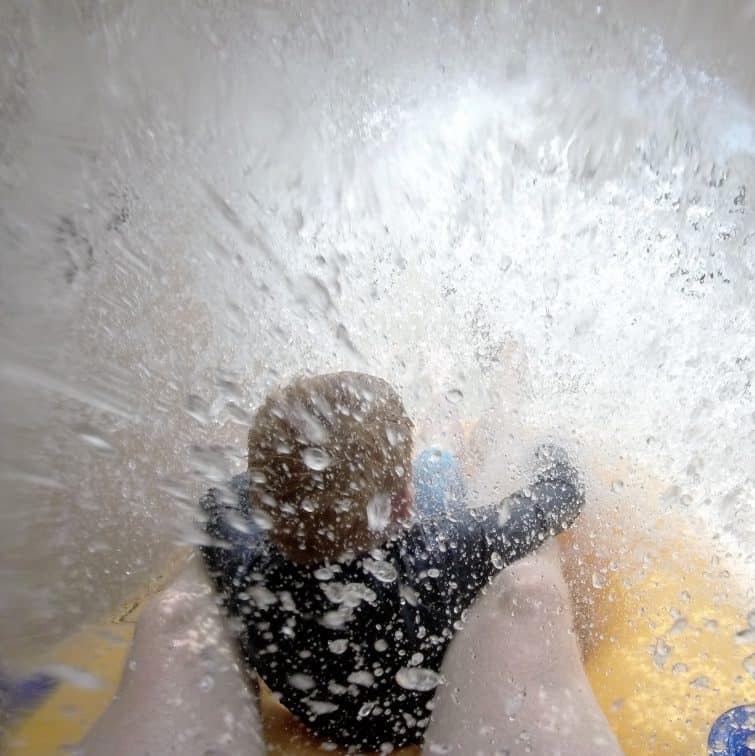 You are allowed to take your action cam on most of the water slides as long as it is securely fastened with a chest or head mount so you should be able to get some awesome footage! Throughout the parks, the rides are colour coded – green, amber and red according to how scary they are! This is a fairly self-explanatory system – but an important and useful feature. You can’t actually see most of the rides – just people shooting off the end of them. This is awesome as it means everything is a surprise the first time you ride them but also means you can’t prepare yourself. I got caught out on one ride which I thought was at a similar level to the other ones I’d been on but turned out to be ‘red’ – I hadn’t clocked the colour coding at this stage and was only really concentrating on height restrictions. Now in fairness Dave knew perfectly well which ride Ben and I were going on and if he’d really thought we couldn’t manage it he wouldn’t have let us go on it! We both loved it but, much to Ben’s amusement, I may have uttered some rather choice words on the way down! If you’re taking children of different ages, it’s worth planning out your day to try and alternate the rides to minimise standing around and waiting for each other – for example we found a whole section of rides – “Sawasdee” that were perfect for our girls and were quite nearby some of the bigger rides meaning Dave and Ben could go off and do some of the big slides whilst the girls played and I sat in the sun watching them. 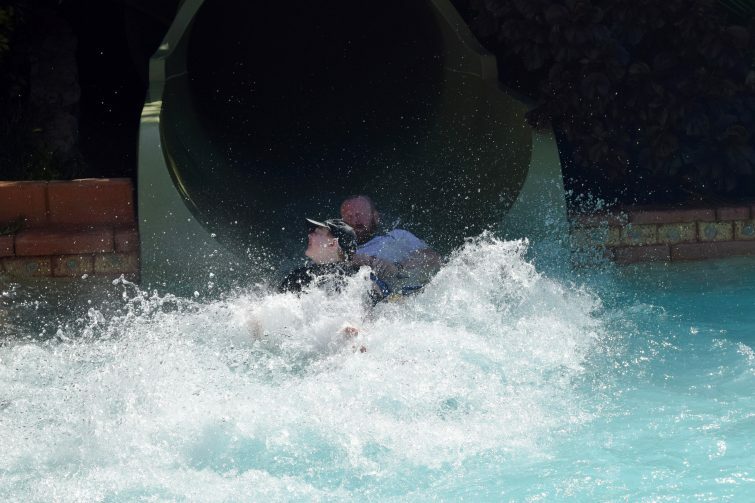 Whilst the girls were pretty patient about waiting for Ben when he was going on slides, I can’t say the same for him – he was itching to make sure he got on all the biggest and best water slides several times over (and who can blame him!). We slipped up a bit really in the first part of the day as we hadn’t planned properly and found that the girls were doing a lot of waiting whilst Dave, Ben and I just went on whichever slide we came across next – were we to go again I think we’d plan ahead a bit more to make sure we evened things out. The rides don’t have age restrictions as such but they do have height restrictions. The minimum height for some of the larger rides is 1.10m – this includes the Naga Racer (which involves racing head first on a mat down some fairly steep drops – I was super nervous, Amy however went on not once but twice and flipping loved it!) and Mekong Rapids. For the bigger rides the height restrictions are 1.25m – only the Tower of Power has a height restriction of 1.40m and a minimum age of 14 years. After experiencing the Naga Racer, Amy was gutted not to be able to go on a couple of the bigger rides but soon cheered up. There was still plenty of her to go on – do watch our video to see her face on the Mekong Rapids, we have a real thrill-seeker on our hands! 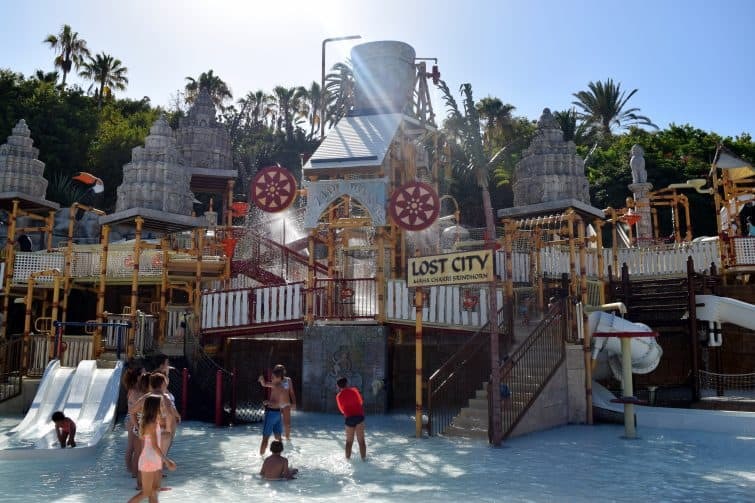 Lost City is a water park in itself with 15 slides and all sorts of exciting water features – I honestly think we could have kept our girls happy playing there most of the day! This area is strictly for children only, you are not allowed to climb around and go on the slides with your child so they do need to be capable of managing this for themselves – at 4 Amy was more than happy to do this. (Next to the main Lost City there is a smaller play area for really little ones to join in the fun.) We just stood in the shallow water to keep an eye on them though there’s plenty of sunbeds for you to relax on while the children entertain themselves for a bit! 12. Make use of the ample seating and sunbeds to rest. 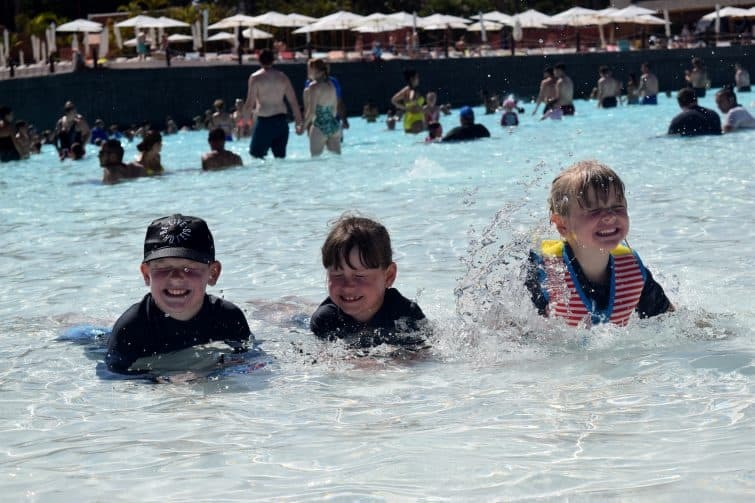 Throughout the park there’s plenty of seating – row upon row of sunbeds at The Lost City and The Wave Palace as well as sunbeds and chairs dotted around the park, usually near the entrance / exit of a slide. These do seem to be quickly “reserved” with towels, however we did manage to find empty ones when we wanted them. The girls and I spent quite a while lying in the sun while Dave and Ben went on Singha – it was nice to be able to rest our legs and dry out for a bit! I imagine if you were visiting the park with older children you could use the sunbeds as a bit of a base to send them off and say “meet you back here in a bit” if you see what I mean. As I’ve mentioned, you don’t want to be carrying your bag around with you for risk of it being taken or just getting wet. This meant for us that our phones and money remained safely in our locker for the day along with my asthma medication. I wasn’t too bothered about not having my phone on me (though I’d have liked to do more insta stories!) but not having ready access to money was a bit of a pain if we wanted a drink or snack. 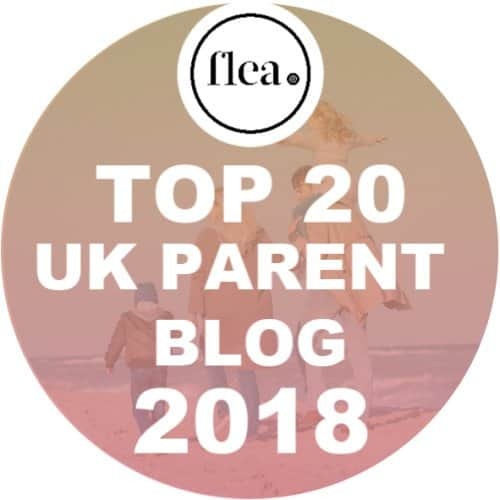 It also wasn’t ideal to be leaving my inhaler in a locker when I was doing such a lot of activity – it didn’t really occur to me until I’d climbed all the steps to get to the top of one of the rides! Short sighted of me I know. I did notice some people wear wearing waterpoof pouches to combat this issue – definitely something I would consider for a future trip. Some of the rides, like the Jungle Snakes, can be ridden individually or in pairs and you just choose which ring you want to take up to the top of the ride with you. Others such as The Volcano are for up to four people so you will most likely find yourself sharing your “clover leaf tube” – the staff will help you to arrange your legs safely so be prepared for semi naked bodily contact with strangers! This feels a little strange at first but you soon get over it! 15. The Wave Palace has exceedingly large waves. Be aware. The Wave Palace proudly claims to have the largest artificial waves in the world – and they’re not joking. At up to 3m high, these waves are an enormous wall of water which will knock the strongest of swimmers off their feet! If you’re feeling bold you can wade right on in there and experience the full force of the wave pool (as you can imagine, Ben was well up for this) but if you’re a less confident swimmer or just not such a big fan of the waves, you can paddle around at the edges of the vast beach and let the waves lap over you. I think Dave had forgotten just how huge the waves were and made the mistake of taking all three kids a bit too far in – the girls quickly came back to me on the edges so definitely learn from our lesson and don’t wade too far in until you’ve seen how big the waves are!! I’ve been asked so many times in the last couple of weeks if it’s worth visiting Siam Park with kids and my answer is HELL YES. 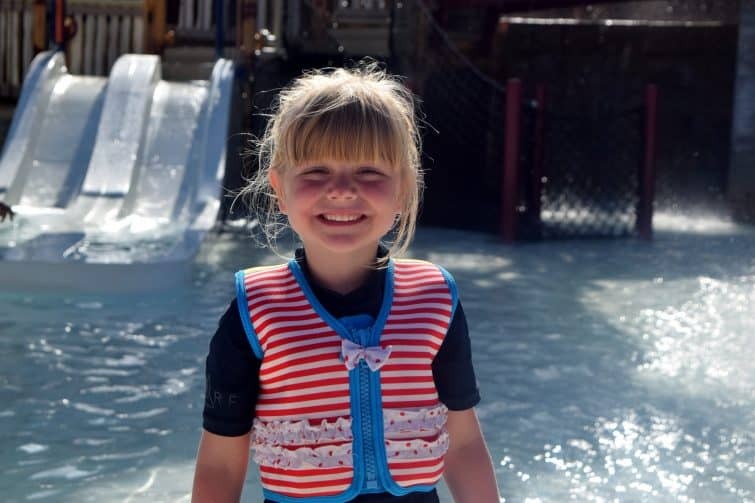 The water park was a real highlight of our holiday – even for Chloe who really doesn’t like heights or anything fast – there was plenty to suit everyone’s needs, you just need to be organised to make sure you benefit from it all. 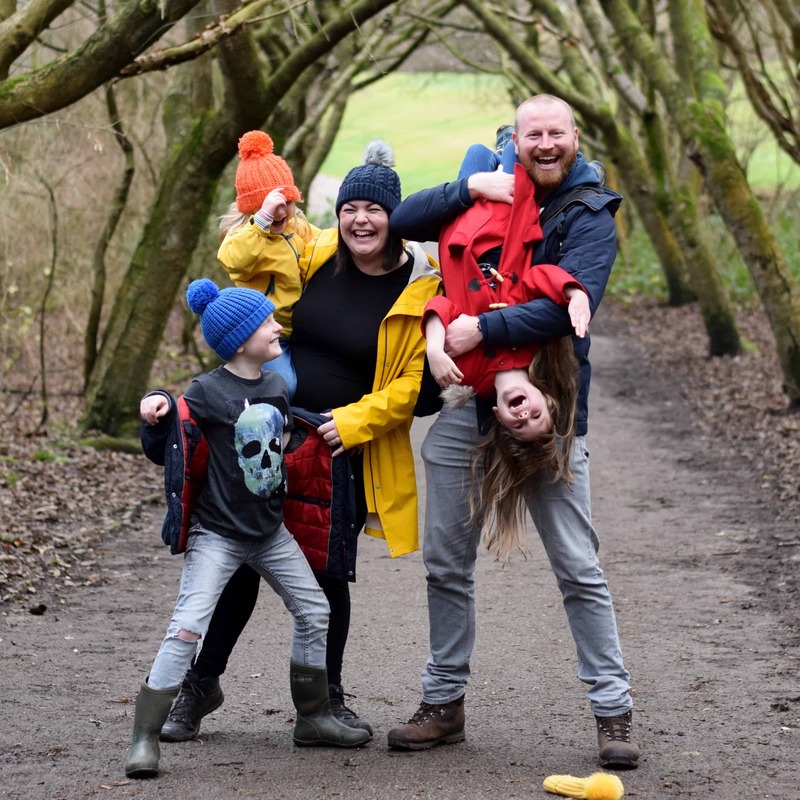 That said, Dave and I are now planning a return trip with friends – the kids are staying with Granny and Grandad! I feel like I could go on about Siam Park all day but I’m pretty sure I’ve covered all bases! If you’ve got any questions leave me a comment below or message me on twitter! I wish I’d given up on my cameras sooner as I had a much better time once I’d put them away! I’ll definitely be buying swim shoes for our next trip. 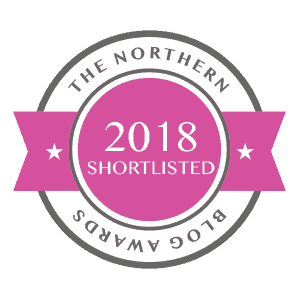 It was ace – we can’t wait to go back again! Ben thought it was hilarious and told anyone who’d listen that I’d been swearing!! It looks fabulous – I think my kids would absolutely love it here. When we next visit Tenerife, we’re definitely making a trip. I love that this review doesn’t just show what’s fun, but talks you through what you need to consider too, like the lockers and colour coding. And now you’ve made me desperate for a holiday in Tenerife! We’re off to a water park next week. I’m already having the discussion with Miss M that perhaps her teeny tiny bikini might not be the most appropriate clothing for that day! 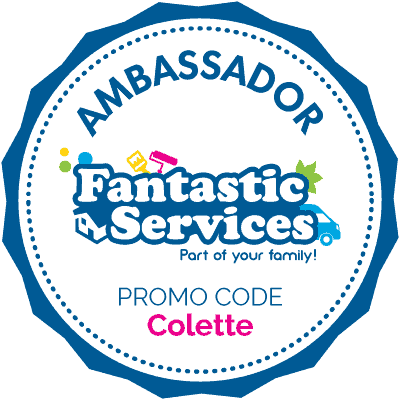 Really goid review thank you. You mentioned you can buy rash vests at siam. Can you remember roughly how much they are and did they have good stock of adult and child sizes? We have booked to go next yr in August and cannot wait. They had them in all sorts of sizes from really small children up to maybe XXL I think? Dave says he thinks it might have cost him about 25 euros – I know we felt we should have bought him one ahead of time really. Hope you have an awesome time!